..i'll start the Round-up of TMNT bits n' bites from the past week's TMNT news now n' finish up when i get back from work n' feed ya some more Turtle Kibbles n' Bits.... i just luve them Kibbles n' bits ..RAWWRRF !!.. Mirage: "August will see the release of not one, but TWO Teenage Mutant Ninja Turtles DVD releases! Lionsgate will release the entirety of the original Teenage Mutant Ninja Turtles cartoon's fifth season across a 3 disc boxed set (which saw the animated debuts of characters such as Mondo Gecko, Muckman and Joe Eyeball, Groundchuck, Tattoo, Wingnut and Screwloose) while Warner Bros. will release this years TMNT feature film on all DVD formats! Both are expected in stores early August - .. .. "
> > > Yes, it's legit. " comedy to drama to reality. Stone" and "Big Shots") are on ABC! ..
- **Posted a page that illustrates the differences between the first three printings of TMNT volume one #1 as another forgery showed up on eBay this week. Click here to view it. - ** J.W. Cornelius sent in two new PSP wallpapers. - |**Greg Cook sent in an image of the 1993 Giant Trolls TMNT figures. - Dan has also incorperated a Google co=op search engine into the site .. the site is just a veritable Turtle library. And after over 10 years online ..it's got volumes of good stuff !! **Click here to get a help on searchin' for what ya need. ..more later when i return from work ..
New Teenage Mutant Ninja Turtles Comic launches in the UK! -->> ..Gosh it's been a crazy few months .. when all the movie news washed me away earlier this year, so much cool Turtle stuff n' tid-bits got swept aside or under the rug like Michelabgelo's left over pizza crumbs !! Some of it i didn't even see at all..until now. With the current television Turtles lookin' to go thru' yet another facelift and TMNT 4 DVDs n' stuff oozin' ever so slowly outta the media mutagen can.. i'm thinkin' a quick Round-up is in order so i can get some gooey stuff outta the way !! Oy!! - ..Courtesy of A.Modeen .. the TMNT Fanatical eps are not on Youtube !! - Courtesy of 4 Colorrebellion & Gaygamer.net..
**Click the Thumb below for Angie's depict- of everyone's favourite mood-monger in the full pic ..
** Click for Angie's PDF portfolio .. !! Tortugapower::Fast Forward is done. One of the partners in the shows production has decided to not go ahead with the planned new episodes that would have comprised the next season, I will not say who or why for now. So for the moment there will be no Space Usagi showing up, let alone any of the other things that were planned, which I will not reveal here. So what happens to the show? It's not canceled, the show will likely be re-developed, your guess is as good as mine as to what the result may be... but either way production will not resume until sometime later this year. So it's not the end of the world - but it may come as bad news for some. Does that mean 10 eps of Fast Forward were in production but were cancelled? Yes. They are dead in the water. Does that mean they were as far along as the Lost season before that got axed? From all I hear the retooling will probably make the show more along the lines of the movie. - ** Posted the extended synopsis (with screenshots) for Episode #123 "Bishop To Knight". - New Teenage Mutant Ninja Turtles Comic launches in the UK! For subscription info **click here (hopefully it will take you to a TMNT page soon). I don't know if this has been brought to the attention of the site yet, but according to davisdvd.com, the TMNT movie from March of this year will be out on VHS on August 7. Hero::"I managed to pick up a couple of copies of the said comic today. The first issue is bundled with a fancy little skateboard launcher (with the skateboard on a bigger scale than the usual tech deck). The main strip is scripted by Trist Huw Jones and drawn by Anthony Williams (best known for Sonic The Comic and The Real Ghostbusters) and looks pretty decent. The second strip is a reprint of the Raphael TMNT Movie prequel comic IN COLOUR! " .."..grabbed a free copy of Toxic from this weekends Bristol Comics Expo. Inside was a couple of TMNT goodies including Gross Grub! .."
**Click for the interview..http://www.ninjaturtlesempire.com/tristan.html .."
Hero:: "I managed to pick up a couple of copies of the said comic today. The first issue is bundled with a fancy little skateboard launcher (with the skateboard on a bigger scale than the usual tech deck). reprint of the Raphael TMNT Movie prequel comic IN COLOUR!" Hero also provided me with a preview for the second issue..check'it !! The other month,Mikey was sent in an slick,glossy U.K. based publication tip ::Cereal:Geek - Animation of the Eighties..
cereal:geek is the new magazine from Busta Toons Productions that focuses strictly on animation from the eighties. On a quarterly basis this 100 PAGE glossy publication with NO ADVERTS features refreshing and enlightening articles, illustrations, scripts, storyboards, a wealth of unseen production materials from your favorite shows, and interviews with those individuals that helped shape this particular decade of animation history! Dungeons & Dragons, G.I. Joe, Galaxy High School, He-Man, Jem, M.A.S.K., The Real Ghostbusters, She-Ra, Teenage Mutant Ninja Turtles, ThunderCats and The Transformers are just some of the shows that appear in the first issue! Also inside is fresh new comic art on your favourite shows ..incluiding TMNT of coarse !! "..There are plenty of Ninja Turtles related goodies in the first issue, including illustrations by professional comic artists alongwith an in-depth look at the intro sequence. .. issue #2 will featurea new illustrated pin-up of the Channel Six news team!" **Click here for ordering info and more previews.. !! - Thanks to EctoCooler :: New TMNT toy pix .. They have this oldschool 'Muppet' quality about them. I got my movie Mike plush today - He's HUGE!!!! ..**CLICK here for an Ebay seller with many plushes available..
there, check out the newer previews for my own #36! better word -- badass art! - ** Click .. Posted the extended synopsis (with screenshots) for Episode #122 "Playtime's Over". - **Greg Cook sent in a picture of Giant Slam Dunk Don from 1992. - *Vaughn Michael(infamous ~t).. sent in box pix of the **(Click)Talkin' Turtle Communicator (1993) and **Krang's Android Body (1992). "I was browsing **Hottopic.com and came across four pages of TMNT gear and DVDs. They even have shirts for us ladies! Just put "Teenage Mutant Ninja Turtles" in the search bar. Thought everyone would like to know! .."
it had started in April in japan.."
**Click here for the English translation..of the TMNT site !! - ((**Click)) Posted the extended synopsis (with screenshots) for Episode #121 "Headlock Prime". - ((**Click)) Posted the alternate cover images for Tales of the TMNT vol. 2 #32. "((**Click)) TMNT 2: The Arcade Game is coming to Wii's Virtual Console. However, no release date has been announced: www.gamespot.com"
- ((**Click))Posted the extended synopsis (with screenshots) for Episode #120 "Home Invasion". May 5th, "Teenage Mutant Ninja Turtles: The Movie", and "Teenage Mutant Ninja Turtles 2: Secrets of the Ooze", will be on the Family channel at 8:00 and 10:00 PM. -->>"Dude! 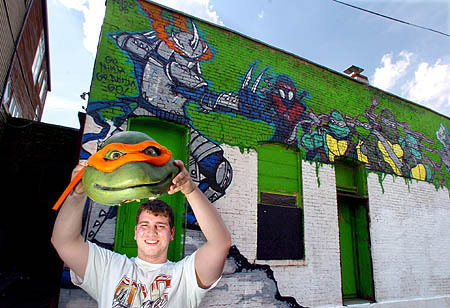 South Side video store gets sued over Ninja Turtles trademark"
A mural on the outside wall of a small video store on East Carson Street in the South Side features four turtles, wearing bandanas and grimacing as if going into battle on a bright green background. There are other images, too, including a wolf wearing what appears to be a red robe and a villainous-looking, armor-clad character. The mural -- along with a flier sent out by the business, MIB Ninja Entertainment -- has become the subject of a trademark infringement lawsuit in federal court. Mirage Studios Inc., the company that owns the trademark for the Teenage Mutant Ninja Turtles, claims the store is illegally using the popular comic book-turned-movie characters for advertising purposes without permission. The lawsuit, filed late Monday, seeks an injunction to keep the video store from using the images, an order requiring that all materials featuring the characters be destroyed and monetary damages. But Milton Barr, 20, who has operated the store on the South Side, and another on West Liberty Avenue, for about six months, called Mirage Studios' demands "ridiculous," and a classic example of a big company going after the little guy. "Under the First Amendment, I have the right to paint whatever I want, as long as I don't make money off of it," Mr. Barr said. But Michael Madison, a professor of trademark law at the University of Pittsburgh, said that's not true. "There is an idea of a free speech defense, but it's very narrow, and it almost never applies when you're using a trademark to advance your business," he said. "They are using the Turtles in connection with a for-profit business." Mr. Barr, who says he enjoys the Teenage Mutant Ninja Turtles, called the mural an adult version of the theme. He also said that he believed trademark law allowed him to use some version of the characters if they were 15 percent different from the originals. Looking at the mural, he noted differences from the Mirage characters in his turtles' shapes, smiles, color, chests and masks. But Mr. Madison said there is no magic number for difference. Instead, what really matters is the "likelihood of confusion," for the public: Would members of the public likely be confused by the video store's use of the Turtles and think that it is in some way connected with the characters? The more details taken out of the design, he said, the better defense a person would have against a trademark claim. But crime-fighting, anthropomorphized turtles who walk upright are pretty specific, he continued. Mirage contends that the MIB Ninja Entertainment stores also have used its Shredder character -- the Turtles' arch enemy -- in advertisements. Mr. Barr acknowledged that occurred under a former investor at the business, but not since he's been in charge. In addition to the trademark infringement allegation, Mirage also filed a claim for dilution, saying that the video stores are diluting the distinctive quality of what they call famous trademarks. That claim does not include the "likelihood of confusion," standard, so even if Mirage would lose the trademark infringement case, Mr. Madison said, it could still win on dilution. The Teenage Mutant Ninja Turtles first appeared in comic books in 1984. They became the subject of an animated series three years later, and most recently were released in the form of a computer-animated movie in March. "With the movie, I get the sense the marketing machine is gearing up again," Mr. Madison said. That means the company has to protect its trademark by policing any unlicensed use of it. Sometimes that means sending letters to cease and desist -- Mr. Barr received two -- and sometimes it might mean filing a federal lawsuit, he said. "Ultimately, big companies have the power and the money most of the time to get what they want. A little video store on the South Side -- I'm guessing is not likely to have the resources to fight this." "If you guys want to see who this Raphael freak is, well, you in Canada...turn on TVTropolis because...*fanfare* my episode of FANATICAL is airing!! WOO!! Features is yours truely and Michelle Ivey. And you can see my turtles!!! Keeper of Raphael's Heart and 13 turtles, 5 of them in eggs"
Turtles come to India !! Jump Games, India's premier games publishing company, has signed an exclusive contract with uclick to release and distribute two mobile game titles based on the cult series, 'Teenage Mutant Ninja Turtles'. The games will be launched on all leading carriers in the country. Along with the games, Jump will offer an entire range of mobile content, including ring tones, wallpapers, screensavers, and themes based on the Ninja turtles. The first game to be released is called 'TMNT - The Power of Four,' based on the recent movie, 'Teenage Mutant Ninja Turtles,' reportedly a runaway hit in the US. The game pushes the player into the shoes of any one of the famous four Ninja turtles, letting the player experience a high flying, high octane combat adventure specially designed for mobile phones. With hair-raising locales as backdrop, players get to defeat opponents to claim victory. The second game to be released shortly is called 'TMNT - Ninja Training NYC,' a cartoon-based game that enables players jump start to 100 years ahead, as they take on the streets of Manhattan along with the super turtles. Speaking about the association, Salil Bhargava, CEO of Jump Games, said, this is for the first time that TMNT is being released in India, and that they are really excited to bring the age-old classic to audiences here. Meanwhile, Jeff Webber, Vice President of Product Development, uclick, said the turtles have a fan base that spans generations and continents. This is the first time these world famous characters have ever been available on mobile phones, where they can reach legions of fans in a way they never have before. - Danny B. of the official TMNT ..:: " .. .. "
- ** (Click) Posted the extended synopsis (with screenshots) for Episode #119 "Obsolete". You can make your television debut in the company of the world's four coolest Turtles - Leonardo, Michelangelo, Donatello and Raphael - when you receive an opportunity of a lifetime to tape a line for one of the Teenage Mutant Ninja Turtles cartoons which will air on television! To make your experience truly unforgettable, you will be taken on a tour for four individuals of the 4Kids Entertainment studio, where Teenage Mutant Ninja Turtles is produced and receive great 4Kids swag! In the forum on usagiyojimbo.com, creator Stan Sakai states: "Space Usagi (and Rhogen) will be in a couple of episodes of next season's TMNT cartoon. I just received one of the script outlines this past week, and it's wonderful - lots of action, but still time for character and relationship development." -Double-whammy Christmas-in-April day! Posted the complete issues for both **Click - Michelangelo #1 and **TMNT Vol. 1 #6. Cowabountiful! -->>.. hey don' knock it til' ya try it !! There's going to be a TMNT double feature on ABC Family, Saturday beginning at 8/7 central. The double feature starts with TMNT 1, then continues with TMNT 2: The Secret of the Ooze.